You have room to move on an ACJ318. Maybe your group is too big to fit in a large-cabin business jet, or perhaps you and your travel companions simply want more space than those aircraft provide. Either way, you may be a candidate to charter a so-called bizliner—an airliner model that has been reconfigured for private use. “I’m frankly a little surprised there’s as much demand as there is,” says Don Haloburdo of Jet Aviation, which just put an ACJ318 Airbus Corporate Jet on its charter rolls. “The customers we’ve talked to, what they like the most is the space. They want to be able to get up and move around.” Haloburdo notes that embassies and touring music groups have been among those expressing interest in the aircraft. California’s Avjet charters out two Boeing Business Jets (VIP versions of Boeing airliners), one based in Burbank, California, and one in Miami. The U.S.-based BBJ charter operator reports growing demand for the bizliners. “Clients want the luxury of flying and sleeping comfortably on eight-plus-hour flights,” says Leslie Cheshier, Avjet’s vice president of charter sales. The B737-based BBJs seat 16 and sleep 14. Fortune 500 executives and movie stars on publicity tours are among major customers. Former President Bill Clinton used one on his 2009 mission to retrieve a pair of U.S. reporters who’d been seized by North Korea. 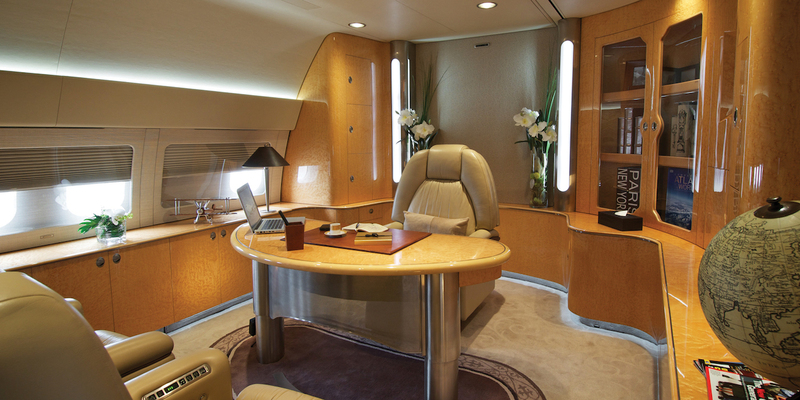 ACJs and BBJs are typically configured like business jets but feature more refined interiors, with divided cabins, a private meeting area, a stateroom, multiple lavs, and global communication systems. Usually, they seat no more than 19 passengers—the limit before more stringent commercial-carrier rules kick in for charter operations. That’s not much more seating than a large-cabin business jet offers, but as Haloburdo notes, “We don’t see [Bombardier] Global 6000s or [Gulfstream] G650s with 10 or 15 people aboard on significant trips—typically just four or five at the upper ends.” The issue of reduced range aside, a fully occupied business jet can quickly begin to feel overcrowded. In contrast, “with this [Airbus Corporate Jet] aircraft, with 10 or 15 aboard, you wouldn’t feel like you were totally cramped,” says Haloburdo, who is Jet Aviation’s vice president and general manager of flight services. 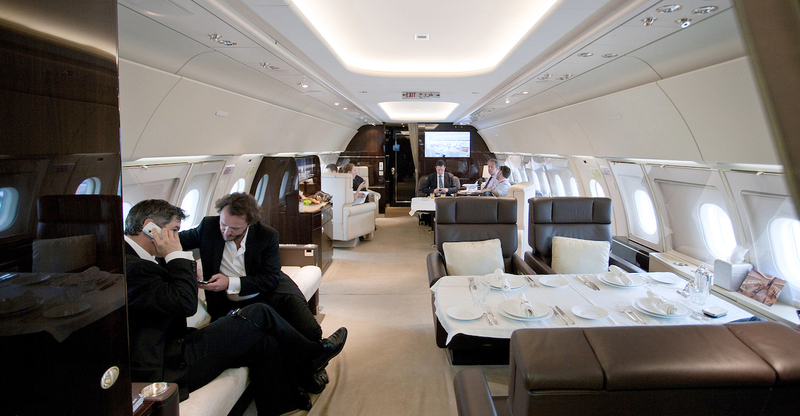 If your group is so large that it won’t fit on an ACJ or BBJ, you can consider even larger jets. In fact, you might want to do so even if one of those models would suffice, argues Richard Brainard, director of maintenance, marketing, and business development at Kaiser Air in Oakland, California. “If you try to move 19 people in the [VIP] airplane,” he says, “they’re scattered all over—some sit in lounges, some in sleeping areas. It’s kind of chopped up.” Instead, he suggests Kaiser Air’s all-first-class B737-500, which hauled 120 to 140 passengers as an airliner and now carries up to 60, plus one flight attendant for every 10 passengers. “It’s not a BBJ,” in terms of luxury quotient, admits Brainard, but he deems it “a perfect application for automaker trade groups, sports teams, and companies doing IPO road shows.” The aircraft has taken groups to the World Cup soccer tournament in Brazil and carried officials of sports authorities to championship games. A media server provides on-demand video to personal devices, and a Gogo Wi-Fi system was recently installed. Kaiser Air also operates a 68-passenger 737-700 for charter, but its availability is limited as it provides twice-weekly round-trip service between California and Hawaii for a homeowners’ association. If you want both a VIP interior and a big passenger load, you can turn to Comlux the Aviation Group, which owns and operates a wide-body VIP B767 that carries up to 63 passengers. It features a bedroom, office, dining room, and lounge, in addition to first- and business-class seating areas. Based in Bahrain, the aircraft attracts clients in the Middle East and Africa, where governments charter it for official business and high-net-worth individuals turn to it for leisure travel, says Richard Gaona, president and CEO of the Zurich, Switzerland-headquartered company. Avjet’s BBJs charter for $12,500 per hour, while Jet Aviation’s ACJ318 retails at $15,000 per hour, though the company will adjust the rate for positioning flights from its Teterboro, New Jersey base. These aircraft are available for charter worldwide, and given the interest in multiday, long-distance travel, such charges rarely affect demand. “When you’re quoting out a $2 million trip, a $100,000 repositioning fee” is acceptable to customers, Haloburdo says. If you really want a bargain, consider the Comlux B767. It’s “less expensive per head compared with an ACJ or a BBJ,” says Gaona. Globally, the U.S. lags in offering big-jet charter way behind Asia, Europe, and the Middle East—the home base for most of the individuals and companies that make these aircraft available. Avjet is “looking to expand our fleet” of executive-configured airliners, says Cheshier. Comlux’s Gaona notes that European charter demand “is very low at the moment” due to the stalled economy, but even that company anticipates adding to its wide-body VIP charter fleet. “We plan to put in service in 2017 a Boeing 777 BBJ and an ACJ330,” Gaona says. One cautionary note, though: if you’re looking for a bizliner for a trip to the U.S., keep in mind that cabotage rules prohibit non-U.S.-registered charter aircraft from flying within the U.S., once you get there. James Wynbrandt, a private pilot, is a regular BJT contributor who has written for the New York Times, Forbes, and Barron’s.